Competition in Telecom Sector is really heating up after the entry of Tata DOCOMO. Tata DOCOMO came up with Pay Per Second Plans which became an instant hit. Now many operators are offering Similar Plans to their customers to tackle the competition from Tata DOCOMO. Vodafone is no exception, Vodafone has silently introduced Pay Per Second Plans without much marketing. Vodafone is offering all calls local as well as STD at 1p/sec. 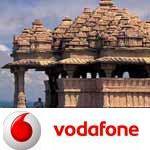 At present Customer of Madhya Pradesh and Chhattisgarh can enjoy the per second pulse rate offered by Vodafone. Recharge Voucher of Rs. 59 which comes with a validity of 365 days will provide Pay Per Second call rates to existing customers. New customers can get this on purchase of New Starter Kit.Thanks Abhishek Gupta for sharing this information.